Extrusion blow moulding machinery under assembly in Graham Engineering’s US factory. Most plastic products are shaped using blow moulding equipment designed to create a variety of shapes and sizes, using plastic resins with varying mechanical and optical properties. 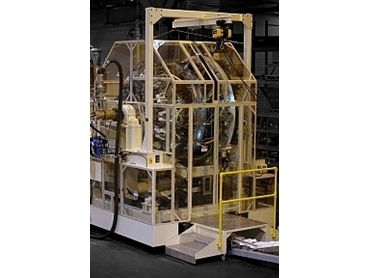 US-based Graham Engineering Corporation (GEC) has designed extrusion blow molding machines to benefit from advanced Human Machine Interface (HMI) development technology to give operators more control of the equipment. The versatile nature of plastics requires flexible machines, but without a well-designed HMI, flexibility and functionality is severely limited. GEC needed an intuitive HMI for their PC-based XBM Navigator control system to provide complete control over the blow moulding process to the machine operators. The XBM Navigator automation system features trouble shooting aides, SPC trending, alarm and set value change recording, among other features. The HMI is user-friendly and suited for remote diagnostics via Internet and other connections. This remote access feature enables GEC service staff in Pasadena (USA) to connect to a customer’s machine and troubleshoot most process or machine-related problems, saving the costs and delays associated with travel to their facility. GEC needed to implement new HMI software because their previous software wasn’t meeting their needs in several key areas. For example, they weren’t able to easily create an HMI with the desired “look and feel”. The HMI software didn’t allow GEC to create and implement custom symbol libraries, making the screens feel lackluster and lacking in detail. Development time was another issue that needed to be improved. The previous HMI solution was awkward to navigate, which made designing and fine-tuning screens for each machine a lengthy and time-consuming process. Connectivity was also a problem with the prior HMI software. GEC needed a new HMI software solution that would address all these issue as well as connect quickly and effortlessly to their preferred brand of automation hardware. GEC eventually found that InduSoft Web Studio development and runtime HMI software fit the bill. With InduSoft Web Studio, GEC would be able to create and import custom symbol libraries that made standardising HMIs across the entire product line easier and time-efficient. Its custom symbol libraries and fast screen switching times reduced design time and provided more robust capabilities. Since their hardware platform is based on the Beckhoff C6640 Industrial PC and connects to Beckhoff I/O modules via EtherCAT, GEC required a company that had experience with Beckhoff products. InduSoft’s built-in drivers and partnership with Beckhoff offered a suitable solution in terms of connectivity, something that had been difficult with their previous HMI software. The direct driver connection from the HMI to TwinCAT was easy to configure and reliable for data communication between the user interface and the real-time control software. Another critical aspect was the ability to purchase flexible runtime packages. Using InduSoft Web Studio, GEC can now develop applications once then deploy them on any supported Microsoft operating system, including Windows CE, Windows Embedded, Windows 7 or Windows Server edition. The HMI developed by GEC provides a user-friendly interface that enables their customers’ operators to control all aspects of the blow moulding process. This gives customers the flexibility to quickly produce all types of quality containers, such as bottles, in mass quantities. Since the HMI includes detailed screens and features that encompass all functions of the machine, switching over from one product to another if fast and easy. Another key feature of our machines is the ability to precisely control and monitor parison wall thickness. During this part of the process, the melted material flows from the extruder into a head then exits the head in a tubular shape that is then molded into the final part. Plastic thickness is controlled at up to 180 points in each mold, and as many as three molds are processed per second on our highest speed rotary wheel lines. Managing recipes is an important feature for maintaining consistency in plastics production. GEC's HMI leverages InduSoft’s patented database connectivity for recipe management, enabling setpoints to be seamlessly added and retrieved. User-defined recipe groups can be created within the HMI software—and users can import and export recipes, reports and real-time data in an XML format via a variety of databases and other corporate software platforms. The security features of the HMI package are used to control access to the machine and restrict user levels for accessing process screens and settings. Security can be set on each runtime individually or networked to a central security system. GEC has seen a dramatic decline in HMI-related service issues such as screen lock-ups or problems with data transmission from the hardware.